William Sutton comes from Dunblane, Scotland. He has written for The Times and the Fortean Times, acted in the longest play in the world, and played cricket for Brazil. His novels pitch Sergeant Campbell Lawless into 1860s London, a city of riches and poverty, literature, loneliness, crime, fraud and road works at King’s Cross — unimaginably different from today. As he unearths the dirt beneath the cobblestones, Lawless becomes familiar with the bowels and sinews of the Victorian metropolis. William’s short stories have been published across the world in weird magazines, for whom he also writes articles about language, music and futurology. His plays have been produced on radio and in London fringe theatres. 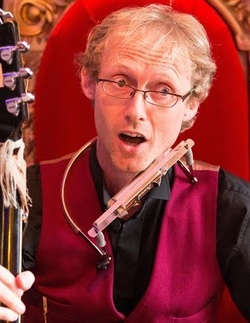 He has performed at events from the Edinburgh Festival and Eton College to High Down Prison and CSI Portsmouth, dismaying audiences with his ukulele. William teaches classics, bats aggressively for The Authors CC, and plays in chansonnier Philip Jeays’ band.